Good morning! Wow, is it just me, or did the world feel like it had been hit by a truck when I woke up this morning? Geez! Running a bit late, but here we go . 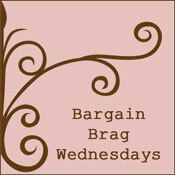 . . welcome to another edition of "Bargain Brag Wednesday" here at BSP—an opportunity for you to share your latest bargain shopping finds, thrift store outfit deals, DIY projects, side-of-the-road pick-ups, consignment shop steals . . . ANYTHING you've done that's saved your money. Use your imagination! Share whatever you've done to save money recently! List it here so that other Bargain Shopping Paradise readers can get inspired. It's a great way to share ideas, and I love seeing how creative everyone gets when it comes to saving money! Please only list family-friendly links. Include your blog name and the name of your "brag" in your link. 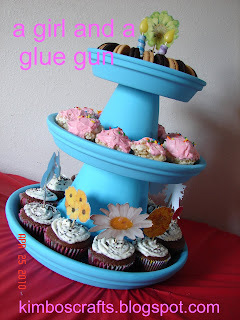 I'm also featuring this really fun terra cotta pot dessert stand from Kimbo West at A Girl and a Glue Gun. Love!! !